Dido’s Still on My Mind is a slow burn. 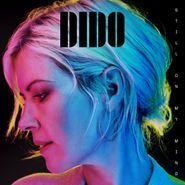 After a five year hiatus, Dido returns with a moody, haunting collection of ballads that seamlessly blends her interest in synth beats and trip-hop vibes with her signature folk-inflected downtempo vocals. (The album was created in close collaboration with her longtime production / songwriting partner Rollo, also known as half of the hard-hitting English electronica duo Faithless.) The result is truly a force of nature, a quiet storm roiling beneath the serene surface.